True RMS reading instrument that permits precise measurements of non-sinusoidal waveform AC current and voltage. 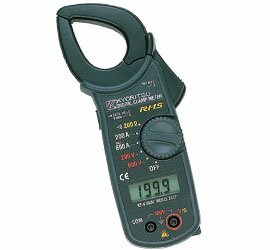 Accurate measurements are also possible at low frequencies from 10Hz upwards. • Designed to meet internationally proven safety standards such as IEC 61010-1, UL3111 and VDE0411. • Three functions in one unit; AC current, AC voltage and resistance.